I have been going here for years. I always have great service. I was early for my cleaning appointment. The person before me didn't show up and I was able to get in instead of just waiting in the waiting room. Thanks! I've never been so content with a dental practice! In all my years of searching for an ideal practice that wouldn't make me feel so guilty for not always keeping up with myself.. this place made me feel warm. My hygienist is awesome and super informative. The greatest thing about my experience, thus far, is how dedicated they are to make sure they get me on the right track so I can have a beautiful smile again. Thank you Tina for making my first visit so awesome! And thanks to the front desk ladies! They are so down to earth! Dr. Kirstin Risse is a graduate with honors of the University of Kentucky, College of Dentistry. She was granted the Wright Scholarship to attend UKCD. She received her undergraduate degree in Microbiology from the University of Georgia. If you’re looking for the top-rated dentists in Norcross, call Norcross Dental Associates today. We are a comprehensive family dental practice dedicated to serving the residents of Norcross and nearby communities. Our professional and expertly trained dental team strives to make visiting our office a pleasant and educational experience. Be sure to ask about our sedation dentistry options to make your visit as comfortable as possible. Call your Norcross Dentists at (770) 334-9880 to schedule your appointment today! We are conveniently located on Sparlding Drive by the Sunshine House Day Care. © 2019 Norcross Dental Associates. All rights reserved. If you prefer to speak to a team member, please call (770) 334-9880. 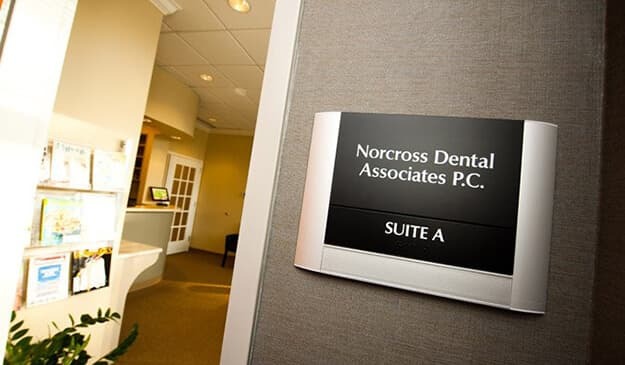 The team at Norcross Dental Associates strives to make visiting our office a pleasant and educational experience.